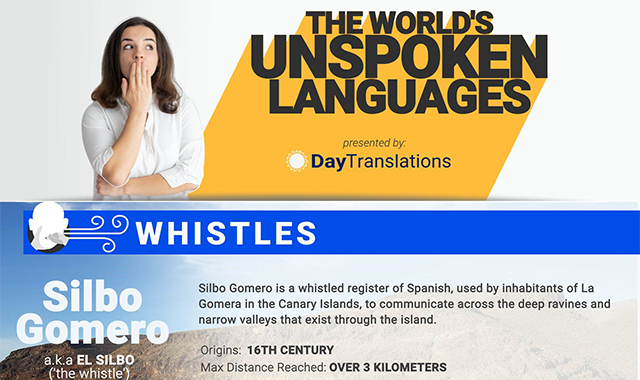 The World's Unspoken Languages #infographic ~ Visualistan '+g+"
Around the world, you'll find that there are more ways to communicate than just using words. They may not be universal as they are specific to certain communities, tribes or regions, but they are proven effective because of the special needs of a specific culture, particularly for those that have no or limited exposure to other cultures. Our special infographic shows you several ways that different groups of people communicate among themselves. These non-spoken languages, such as whistles, hums, clicks, signed language and talking drums are more effective for them, due to geographic, personal, and physical conditions. Talking through drums and whistles is effective for people who live far apart from each other, especially those living across valleys and along mountainsides. The sounds of the drums and whistles do not change despite the distance. Signed languages are good for those with hearing and speaking impairment. Hums are used by a very tight-knit community within the depths of the Amazon forests. African tribes and Aboriginal communities in Australia use click language.